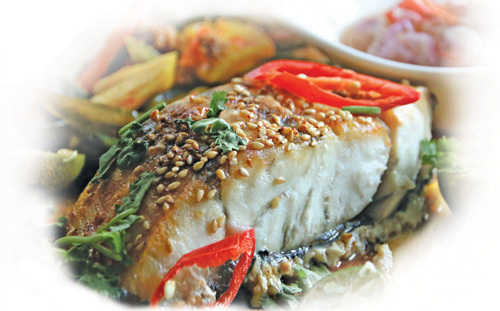 Place the barramundi steaks on the tray, skin side down, and spray (or brush) with some olive oil. Sprinkle more roasted sesame seeds on the flesh. Roast barramundi in the oven at 200°C for 20 minutes. Place cincalok in a small bowl. Add sliced chilli and shallots. Mix well and taste. You can adjust the quantity of the ingredients to sit your taste. Set this aside. 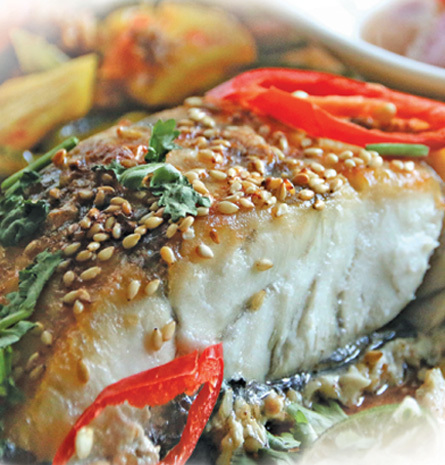 To serve, place the barramundi on a serving dish. Garnish with sliced chilli and chopped coriander. Serve with the sambal cincalok and acar.